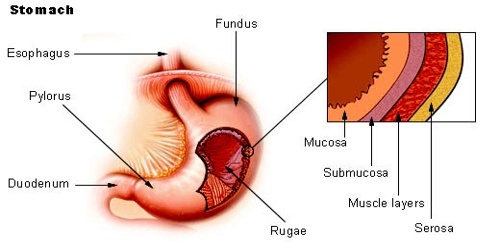 Gastric mucosa is the mucous membrane layer of the stomach which contains the glands and the gastric pits. It consists of epithelium, lamina propria, and the muscularis mucosae. In its fresh state, it is of a pinkish tinge at the pyloric end and of a red or reddish-brown color over the rest of its surface. In humans it is about 1 mm thick and its surface is smooth, soft, and velvety. It consists of simple columnar epithelium, lamina propria, and the muscularis mucosae. The gastric mucosa is normally covered by a thick layer of mucous. Once this layer is removed, one can make out a number of pores known as gastric pits. Each pit is the out let for 3-7 gastric glands. The gastric glands are tubular glands which extend from the pit up to the muscularis mucosa. Each gland has got isthmus, neck, body and base. The characters of the gastric glands vary from the cardiac to the body and fundus and in the pyloric regions. They have five different types of cells. 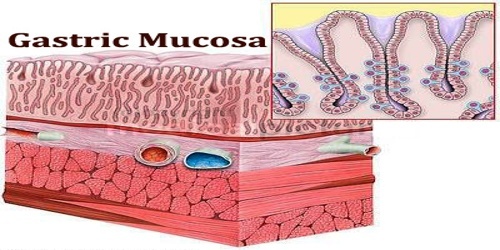 Gastric mucosa contains six different types of cells. In addition to the tall columnar surface epithelial cells mentioned above, there are five common cell types found in the various gastric glands. 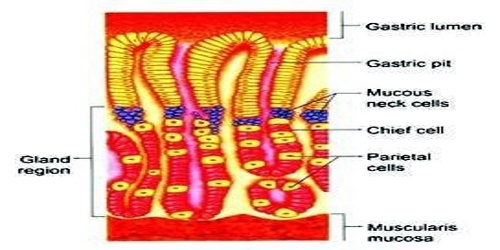 Mucous neck cells: Secrete soluble mucin whereas the mucous cells lining the surface of the stomach which are derived from mucous neck cells secrete insoluble or visible mucin. This visible mucin is the one that coats the inner surface of stomach. The mucous cells also secrete bicarbonates. The mucous secretion is alkaline. Chief/peptic/zymogen cells: These cells are located predominantly in gastric glands in the body and fundic portions of the stomach. These cells secrete pepsinogen, from which the proteolytic (protein-digesting) enzyme pepsin is formed. There are two varieties of pepsinogen, known as pepsinogen I and pepsinogen II. Gastrin cells: It is also called G cells, are located throughout the antrum. These endocrine cells secrete the acid-stimulating hormone gastrin as a response to lowered acidity of the gastric contents when food enters the stomach and gastric distention. The G cells present in the pyloric antral region secrete gastrin, one of the important hormones of GI tract with few important actions. Undifferentiated cells: These are believed to be undifferentiated and are believed to be the precursors of the parents of parietal cells, chief cells and enteroendocrine cells. Gastric glands of cardiac region are shorter and are predominantly mucous cells. Parietal or oxyntic cells: It is found in the glands of the body and fundic portions of the stomach secrete hydrogen ions that combine with chloride ions to form hydrochloric acid (HCl). The acid that is produced drains into the lumen of the gland and then passes through to the stomach. This process occurs only when one or more types of receptors on the outer membrane of the parietal cell are bound to histamine, gastrin, or acetylcholine. Endocrine cells: It is called enterochromaffin-like cells because of their staining characteristics are scattered throughout the body of the stomach. Enterochromaffin-like cells secrete several substances, including the hormone serotonin.